President Donald Trump appears poised to drive a stake through the heart of the Iran nuclear deal Tuesday, when he announces his verdict on US sanctions relief underpinning the landmark accord. Trump has, unsuccessfully, demanded changes to the Obama-era deal, which saw Iran mothball a suspected nuclear weapons program in return for massive sanctions relief. The president tweeted he would announce his decision at 2:00 pm (1800 GMT), even as British foreign secretary Boris Johnson shuttled around Washington to reach a last-gasp breakthrough. One European diplomat echoed the mood around foreign embassies in Washington, saying "there is plainly a difference of opinion," acknowledging Trump seems poised to walk away. Concretely, the US president will now to decide whether to continue to waive sanctions on Iran's central bank and its oil sector dealings, a key pillar of the agreement. "It's pretty obvious to me that unless something changes in the next few days, I believe the president will not waive the sanctions," the European official said. "I would like to pretend to you today that I feel that there is a chance of the existing (deal) remaining intact," the official said. "I think that that chance may exist but it is very small." "We are preparing more for the scenario of a partial or total withdrawal than for the US staying in the deal," the official added. Iran's President Hassan Rouhani -- who very publicly advocated engaging with America and would be politically exposed should the deal fail -- said his country would stay in the agreement even if the United States pulls out. It is unclear whether Iran's more hardline military leaders, or Supreme Leader Ali Khamenei, hold the same view. And with tensions building between Iran and Israel, Tehran's response could well come away from diplomatic antechambers or the meeting rooms of multilateral fora. With the arrival of John Bolton as National Security Advisor and Mike Pompeo as Secretary of State the Iran hawks now appear to be in the driver's seat. Imposing oil sanctions could be the first step of a "a broad coercive campaign" to "break the regime's back," according to Cliff Kupchan of the Eurasia group. Nearly three fourths of American manufacturing firms and half of services companies expect the tariffs imposed by the US and China will prompt them to increase prices, and a large share expect supply disruptions, according to a survey released Monday. The threats and counter-threats of tariffs on tens of billions of dollars in exports exchanged between the United States and China, as well as between the United States and Europe, have rattled financial markets in recent weeks over fears they could spark a trade war that would derail the global economic recovery. And Washington does not appear to be much closer to a solution after a high-level US delegation ended two days of talks in Beijing last week without announcing any breakthroughs. Companies surveyed by the Institute for Supply Management had been reporting rising prices for materials for the past two months, including sharp spikes in steel and aluminum. And many executives in recent corporate earnings reports also reported seeing rising costs, and were planning to increase prices to consumers. 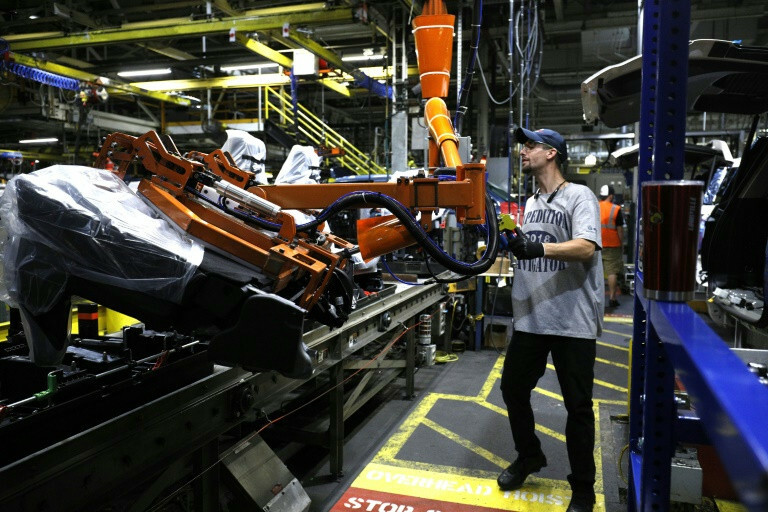 In its semi-annual economic forecast, ISM said 74 percent of manufacturing companies and 50 percent of services firms believed the tariffs would "raise the price of the goods that you produce and deliver to your customers." Manufacturers expect an average price hike of 5.4 percent due to the tariffs, while the services firms put the figure at just over seven percent, the survey showed. Meanwhile, close to 60 percent of firms in both sectors expect "delays and disruptions" in their supply chain because of the tariffs. This too could lead to price increases and companies have already been complaining about logjams in deliveries, in part because of the lack of truck drivers. Manufacturing firms already have seen increases of 4.8 percent in their input costs through the end of April, while services firms have seen an increase of 1.3 percent. Timothy R. Fiore, chair of the ISM Manufacturing Business Survey Committee, said steel and aluminum prices have jumped 20 percent so far this year, and the fabricated metals sector has seen the biggest increase in prices paid, with a 10 percent jump. In the services sector, the "prices are pretty controlled," with the exception of fuel-related goods and lumber, Anthony Nieves, chair of ISM's Non-Manufacturing Business Survey Committee, told AFP. Companies around the country have reported difficulties finding workers to fill open positions and this survey showed 78 percent of manufacturing companies and 64 percent of services firms have struggled to hire in the past six months. ISM reported that about half of those manufacturers had raised wages to attract workers, compared to just a third of services firms. "We're struggling finding qualified labor and right quantity," Fiore said. About half of companies surveyed had increased training to attract new workers, but Nieves noted that some skills are not transferable, for example from retail to construction. Nieves noted the reports in recent months of shortages particularly of skilled labor, in construction and for truck drivers. "It becomes more than just increasing wages. If the labor pool is not there is doesn't matter what you pay," he said. The survey showed firms in both sectors were generally upbeat about their prospects for continued growth this year, and five of the big six manufacturing firms already in expansion mode. "However, finding and onboarding qualified labor and being able to pass on raw material price increases will ultimately define manufacturing revenues and profitability," Fiore said. About a third of companies in the two sectors said they planned to increase capital spending this year, but the vast majority attributed it to general business conditions rather than to the business tax reform approved in December. The average planned increase in spending is much higher than the previous survey at 10.1 percent compared to just 2.7 percent. 0 Response to "US manufacturing firms expect higher prices from tariffs: ISM"